DETROIT (AP) Stan Van Gundy worried over the weekend that the Detroit Pistons were becoming too reliant on Blake Griffin. That wasn’t a problem Monday night. Lillard scored 20 points and C.J. McCollum added 14 for the Blazers, who lost again after falling at the buzzer at Boston on Sunday. Portland was without Evan Turner on Monday because of a left calf injury. Detroit led by 13 in the second quarter and was up 49-43 at halftime. The Pistons pushed the lead to double digits again in the third. A 9-0 run capped by Luke Kennard’s 3-pointer made it 75-57. Trail Blazers: Lillard is six points shy of Jerome Kersey for fifth place on the franchise’s career scoring list. 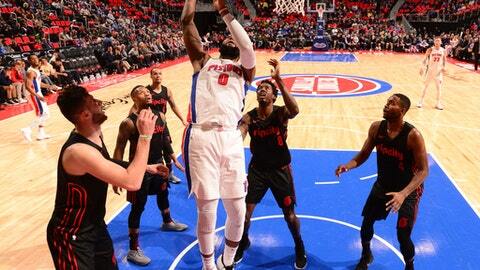 Pistons: Dwight Buycks (illness) missed the game. … Detroit has won five in a row against Portland. The teams meet again March 17 at Portland. Drummond now has 266 double-doubles since entering the NBA in 2012-13. He’s tied with DeMarcus Cousins for the most in that span. Drummond and Griffin seem to be developing some chemistry together, and they combined for 11 assists. The Blazers went 0-3 in a four-day stretch that included road games against Toronto, Boston and Detroit.